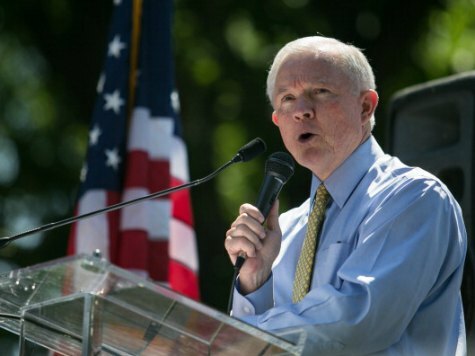 On Monday, Sen. Jeff Sessions (R-AL) warned that illegal immigrants may receive thousands of dollars from the federal government without paying income taxes after President Barack Obama’s “post-modern” executive amnesty is enacted. Speaking at a Judicial Watch event, Sessions, who has said that Obama wants his executive amnesty and “alternative immigration system” implemented before Americans discover the consequences, mentioned that after illegal immigrants receive Social Security numbers and work permits under Obama’s executive amnesty, they could be eligible for a $1,000 tax credit per child in addition to an average $2,600 Earned Income Tax Credit payment. That means that some illegal immigrants, if they have multiple children, could receive nearly $5,000 from the federal government without paying any income taxes. Sessions, who is calling on lawmakers in Congress to prohibit federal funds from being spent to implement Obama’s executive amnesty, said there is “great trepidation” that Obama is creating an “alternative” and “entirely new” immigration system that he does not have the power to create. He said the Framers would be “horrified” by Obama’s executive amnesty. Even worse, according to Sessions, is that in Obama’s alternative immigration system, American workers, immigration enforcement officials, and “John Q. Public” are not stakeholders while pro-amnesty interests groups who were invited to numerous White House meetings are.